^ 中国网 - 翼装飞行--挑战极限运动的极限 互联网档案馆的存档，存档日期2015-06-10. ^ L'uomo volante ce l'ha fatta. Corriere della Sera. 1997-11-01 [2011-05-18] （意大利语）. ^ Patrick, l'uomo shuttle. La Gazzetta dello Sport. 1997-11-01 [2011-05-18] （意大利语）. ^ Bird-Man Worldwide Instructors list. Retrieved 28 January 2008. ^ Mei-Den, Omer. 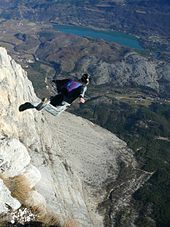 The epidemiology of severe and catastrophic injuries in BASE jumping.. PubMed. Retrieved 8 December 2014. ^ "Alexander Polli Wingsuit Downhill Gate Bashing: Precision Of Human Flight". YouTube. 26 November 2012. Retrieved 23 December 2012. ^ U.S. Parachute Association > SIM > Read > Section 6. Uspa.org. （原始内容存档于2015-09-06）. Retrieved 18 May 2010. Michael Abrams. Birdmen, Batmen, and Skyflyers: Wingsuits and the Pioneers Who Flew in Them, Fell in Them, and Perfected Them. 2006. ISBN 1-4000-5491-5. Matt Gerdes. The Great Book of BASE, BirdBrain Publishing. 2010. ISBN 978-1-4000-5491-6. Scott Campos. 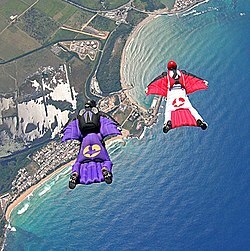 Skyflying Wingsuits in Motion. 2005. Hickley, Matthew (7 June 2006). "Special forces to use strap-on 'Batwings'". London:Daily Mail. Retrieved 6 May 2012. "Wingsuit flyer dives through hole in Chinese mountain". BBC News 26 September 2011. Retrieved 12 May 2012. (Brief article with video).